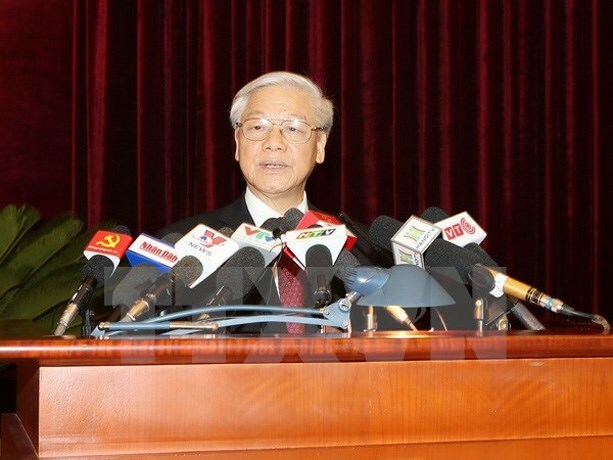 Hanoi (VNA) – Party General Secretary Nguyen Phu Trong has signed the first-ever regulations on specific standards and assessment criteria for officials under the management of the Party Central Committee, Politburo and Secretariat. Under Regulation 90-QD/TW, Party senior officials must show absolute loyalty to the Party, nation and people, and steadfast trust in the Marxist-Leninist ideology, Ho Chi Minh thoughts and the ideal of national independence and socialism. The officials are required to always put the interests of the Party, the nation and the people first, and must be willing to sacrifice for the Party’s revolution, the country’s independence and freedom as well as people’s happiness. The officials must set examples for others in morality, lifestyle and attitude, while resolutely fighting against degradation in political ideology as well as signs of self-evolution and self-transformation. The regulations emphasise that the officials must not have greed for power, and must prevent their relatives or friends from taking advantage of their positions for personal interests. In terms of personal capacity and prestige, officials holding high positions should have innovative mindset, strategic vision and scientific working methods and political sensitivity, along with strong capacity in leading, directing and organising the effective implementation of Party and State’s policies and laws. They must be dynamic and hardworking, and have high prestige among Party members and the people. Besides general regulations, the Politburo also stipulates detailed standards for specific positions, including Party General Secretary, the President, the Prime Minister, the National Assembly Chairperson, members of the Party Central Committee, Politburo and Party Central Committee Secretariat, among others.